Leveraging new media landscape to create interactive picture books. We are delighted to work with an organization that has made the commitment to deeply understand the preschooler’s learning process as part of its core mission. 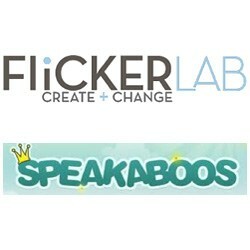 Officials today announced a strategic partnership between FlickerLab (http://www.flickerlab.com), a cutting-edge transmedia design, technology and production company, and Speakaboos (http://www.speakaboos.com), an award-winning subscription service that delivers educational interactive books to children 2 - 6 years old. FlickerLab and Speakaboos are working together to create an extensive, highly curated library of interactive picture books and leveled readers for distribution both in the U.S. and internationally. Flickerlab’s Director of Education and Curriculum, Dr. Carla Seal-Wanner, adds: “We are delighted to work with an organization that has made the commitment to deeply understand the preschooler’s learning process as part of its core mission. Speakaboos stories and songs are curated by its Chief Content Officer, Dr. Alice Wilder. As the former Head of Research and Development for Blue’s Clues and Co-Creator of SuperWhy, she understands what preschoolers both want and need." FlickerLab has produced over 100 animated and interactive e-books for some of the most beloved kids book properties, as well as thousands of hours of award-winning animated, live-action, and interactive content for every platform. Past clients include Disney, BBC, HBO, MTV, PBS, Nickelodeon, Showtime, and Cartoon Network. FlickerLab is headquartered in Soho in New York City. Speakaboos distributes one of the largest catalogs of children’s interactive picture books in partnership with publishers, content owners, authors and illustrators such as The Jim Henson Company, ABRAMS, Charlesbridge, and DK. Over 500K consumers enjoy Speakaboos content across online, mobile, tablet and classroom platforms and subscribers spend over 120+ minutes per month on the service reading an average of 40 storybooks. Speakaboos was named “one of the great websites” by the American Library Association, received an A+ from Education World and has been described as an “impressive”, “indispensable” and “valuable” resource for literacy. FlickerLab is a cutting-edge transmedia design, technology and production company. FlickerLab has created thousands of hours of award winning animated, live-action, and mixed media content for every platform, from iPads, eBooks, smart phones and the web, to network television, print books, and theater screens. FlickerLab is a pioneer in the age of transmedia, leveraging their own proprietary live animation toolset, a deep experience base in producing for every platform, and a unique strategic vision of how to most effectively create meaningful content in this new platform-hopping media landscape. Visit http://www.flickerlab.com. Speakaboos is an award-winning subscription service that delivers educational, entertaining, interactive picture books to children 2 - 6 years old. Speakaboos features one of the largest catalogs of children’s interactive picture books developed in partnership with leading publishers such as The Jim Henson Company, ABRAMS, DK, Orca and Charlesbridge. Speakaboos is enjoyed on computers, tablets, and mobile devices and is used by thousands of students in hundreds of homes, classrooms and libraries worldwide. Speakaboos educational value has been recognized by the American Library Association, Education World, the Aspen Institute and O’Reilly Media. Visit http://www.speakaboos.com.